Shelf Inflicted: A British National Treasure Indeed! A British National Treasure Indeed! Stephen Fry has already given readers a taste of his tumultuous adolescence in his autobiographical first novel, The Liar, and now he reveals the equally tumultuous life that inspired it. Sent to boarding school at the age of seven, he survived beatings, misery, love affairs, carnal violation, expulsion, attempted suicide, criminal conviction and imprisonment to emerge, at the age of eighteen, ready to start over in a world in which he had always felt a stranger. One of very few Cambridge University graduates to have been imprisoned prior to his freshman year, Fry is a brilliantly idiosyncratic character who continues to attract controversy, empathy and real devotion. How can you not love a man, that in the middle of why he kept his crooked nose veers off to discourse on how the monarchy is the crooked nose of Great Britain. Brilliant stuff! Stephen has such a command of language and the written word that I felt his pains and triumphs. He agonizes over his lack of musical ability yet in the next breath he's soaring with his first tale of love. His love of words. His toys as he calls them. Using them to give this memoir a very unique title and strengthening my own love of language. Unlike others, I knew a few things going in so I didn't find a lot of what he relayed quite so shocking. What I did find surprising is just how sincere he is over the pain some of his misadventures had caused others. A lot of biographies of celebrities either celebrate their crimes or try and sweep them under a rug. Stephen faces his head on and I found that profoundly heartening. 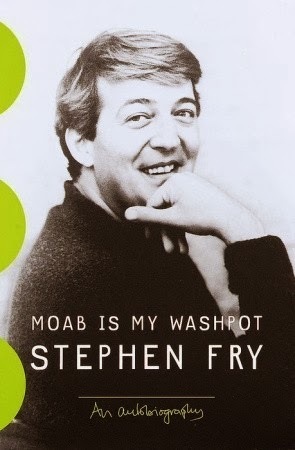 I am absurdly glad that I already have The Fry Chronicles so that I don't have to wait to continue Stephen's memoirs.